Ashwagandha Root, Energy Support & Stress Relief, FREE GIFT WITH AUTO SHIP! Ashwagandha (Withania somnifera) is an incredibly healthy medicinal herb and is one of the most powerful herbs in Ayurvedic healing. Many of its health benefits are attributed to the high concentration of withanolides. It has been used in ancient times for a wide variety of conditions, and is most well known for its stress relieving benefits. The word Ashwagandha is translated to the strength and smell of a horse and is believed to give you the vigor and strength of a stallion. Ashwagandha is also called Indian Ginseng and is one of Ayurveda’s most highly acclaimed adaptogens. An adaptogen is an herb with many nervine benefits, charging the body when it needs it during the day, and relaxing overactive nerves for easy and restful sleep at night. Aswhagandha provides all sorts of other benefits for your body and brain. For example, it can reduce cortisol, lower blood sugar levels, boost brain function and help fight symptoms of anxiety and depression. 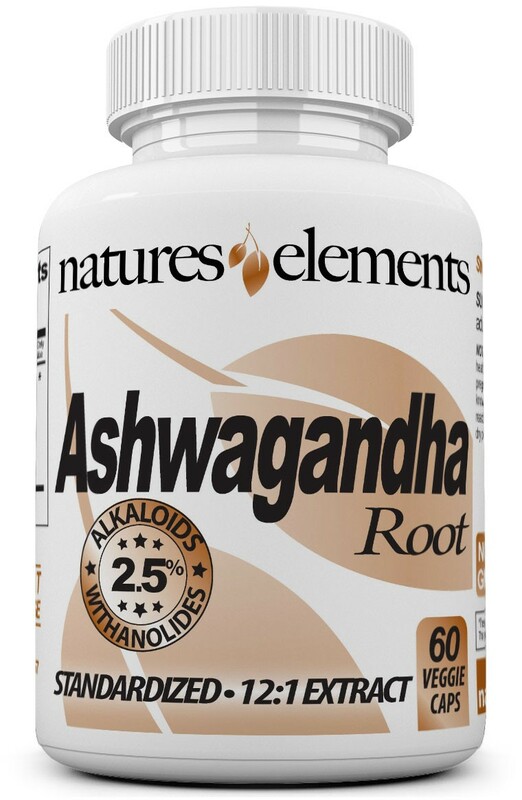 The rejuvenating, energizing and strengthening properties of Ashwagandha are attributed to its root and not to its leaves. The leaf of this herb is used mostly for external purposes.There are some companies who make Ashwagandha extract using the plant’s leaves instead of just the root. Natures Elements uses ONLY 100% of the roots. In all the textbooks and pharmacopeias around the world regarding Ashwagandha their specifications are based entirely on the root, the leaf appears nowhere. The extracts containing leaves have so little safety and efficacy data supporting them, and many countries regulatory authorities disapprove extracts with leaves and allow solely root extracts. Two important constituents contained in Natures Elements Ashwagandha are Withanolides and Alkaloids, which are tested, measured and guaranteed. While many chemicals have been isolated from this plant, withanolides have received much research and attention because of their role in activating certain hormones. (According to a review published in the March 2004 issue of “Alternative Medicine Review.”) Most of the beneficial effects connected to withanolides are improved immunity, sedative properties, anti-inflammatory, and antioxidant benefits have been demonstrated in animal studies. Limited human research is showing promise. Ashwagandha is a traditional medicinal herb with multiple health benefits. It can help fight depression, reduce stress and anxiety, boost fertility and testosterone in men, and may even help brain function. Supplementing with Ashwagandha may be an easy and effective way to improve your health and quality of life. Ashwagandha is taken daily with two small easy to swallow capsules. 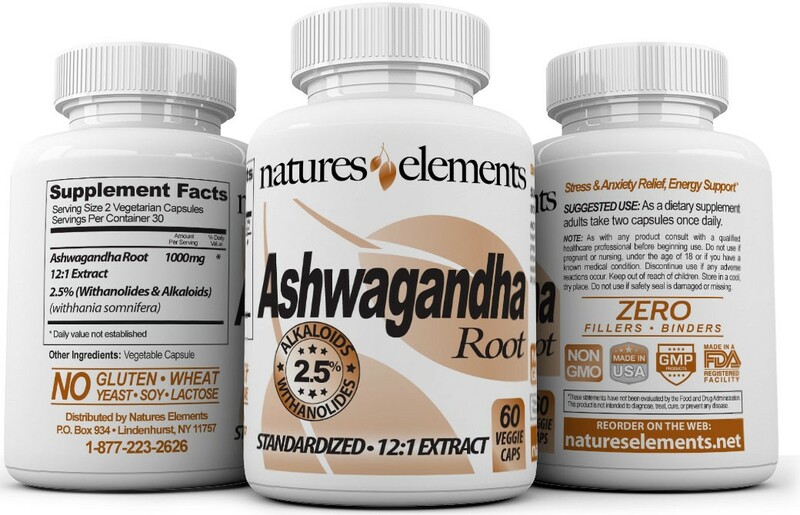 Each bottle of Ashwagandha Capsules contain a 1-month supply. Although Ashwagandha may work quicker from one individual to the next, we recommend you use it on a daily basis for the recommended period of time. After consistent use for at least 3 months, you should begin to see and feel results. You may achieve continued results the longer you are on the product. Be sure to order an ample supply. Natural medicine is designed to create a holistic balance within the body and can take time to propagate through your system. Be patient stick with it...you’ll be glad you did!